« Pressure transmitter pushbuttons to the rescue! Who wrote the book on pressure and temperature measurement? Ever hear the expression, “They’re the guys who wrote the book”? When you hear who it is that “wrote the book”, they immediately gain authority over the rest of the “guys in the field”. It means they’ve taken the time to pull the fundamentals and inner workings into a centralized place, and they have the confidence in their works to share it with the world. 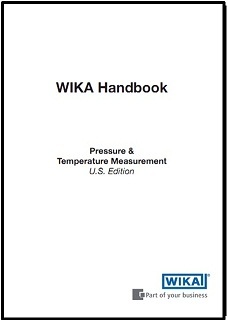 WIKA wrote the book: a fat 436 page reference manual, WIKA Handbook, Pressure and Temperature Measurement. It is a total reference guide. The first third covers mechanical pressure gauges, electronic pressure transmitters and diaphragm seals in depth. The second third covers mechanical glass and bimetallic spring thermometers and capillary and bulb filled systems temperature sensors along with electonic RTD and thermocouple thermometry. The last third covers calibration, a comprehensive listing of international standards, materials compatability tables and an overview of applying instruments in hazardous areas. It’s not beach vacation light reading, but it is an excellent reference guide with all the advantages of electronic search. This entry was posted on October 25, 2011, 3:17 pm and is filed under Pressure Gauges, Pressure Transmitters, Temperature, Temperature Transmitters, Thermometers, Transmitters, WIKA. You can follow any responses to this entry through RSS 2.0. You can leave a response, or trackback from your own site.